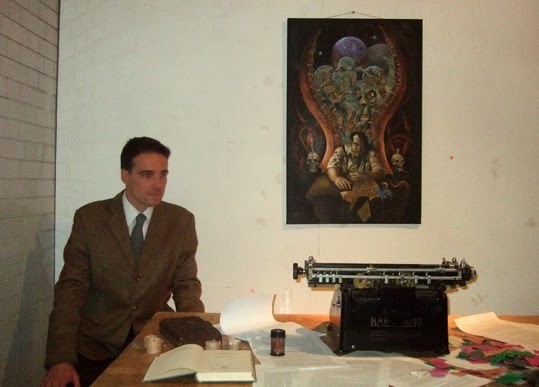 If you are a fan of HP Lovecraft's tales of the Cthulhu mythos and live in London then you won't want to miss Father Dagon, a play at The Rag Factory, off Brick Lane, until Saturday night. The company performing it, Dread Falls Theatre describes Father Dagon as "combining actors, dancers, musicians and visual artists to create a world in which roaming audiences experience H.P. Lovecraft’s fiction." Dreams in fact form an important part of the play, and the whole thing - conducted in perambulatory theatre style - is like some recurring nightmare from the head of HP Lovecraft. The photo at the top shows the first scene in the drama - the horror author himself in his study, talking about his inspiration for his stories. I don't want to give away too many spoilers though, as this is a play that needs to be experienced fresh. H. P. Lovecraft: The Complete Collection. (With Accompanying Facts): 62 Short Stories and 5 Novellas.